For many of us, especially deep-feelers like me, when we start to experience these inevitable lows in our relationship, we may conclude that something is inherently wrong with it. But what if that assumption is just smoke and mirrors? What if it is preventing you from truly experiencing the real love you crave? Believing something is wrong with your relationship might, tragically, lead you to conclude that the relationship has failed and should be ended, even though it’s actually pretty healthy and promising. I’ve made that same jump of reason in the past. Multiple times in my twenties, I ended relationships full of potential because bad feelings were arising more often than I thought they should. I thought it meant something was wrong with him or with us. Being someone who is highly attuned to what I feel, I have always taken my feelings really seriously. When I feel bad, I feel really bad. And when things feel, well, blah, I feel that deeply, too. As had been my norm in past relationships, when my partner and I began to get over those hormone-stoked, bursting-with-love early months of our relationship, I started to feel moments when things didn’t feel “good” anymore. When it all felt “dull.” When he wasn’t behaving how I thought he ought to. When we weren’t “connecting” like I thought we should. Like I had done in the past, I could have taken this as a sign that something was wrong with our relationship, and that he was the wrong man for me. 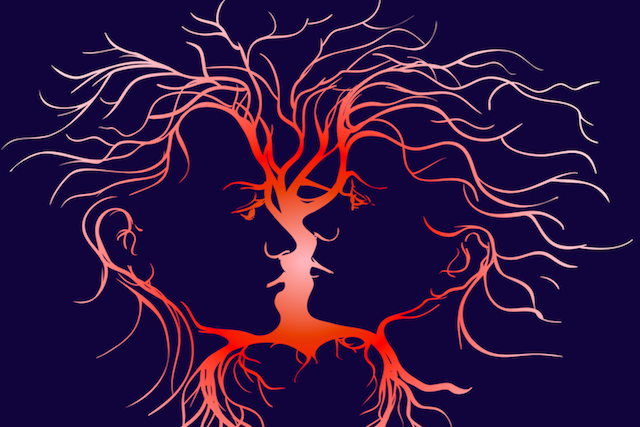 But I was gifted with a powerful secret that changed everything at a relationship workshop we had attended together to preemptively deal with the normal stuff that sabotages great relationships (we were committed to this relationship thriving): This dullness was normal and healthy. As I let the power of this one mental shift sink in, and marinated in the subtleties of what it meant, my relationship began to full-on thrive—and continues to years later. My hope is that it can change your relationship for the better, too. Imagine your emotional life as a spectrum from terrible to wonderful, with neutral in the middle. It is completely normal to spend one-third of the time on the negative side of the emotional spectrum, one-third on the positive, and one-third in a neutral state. This is especially true for sensitive souls like me, because we feel things so deeply: anything less than positive registers as uncomfortable, or negative. When I realized that two-thirds of the time it is absolutely normal to not feel “good” when it comes to my love life, I felt immense relief. It means that there is nothing wrong with my experience. It means I can stop feeling upset that I’m upset, or mad when things are just okay. I can stop feeling so disappointed when I feel unhappy, dull, irritated, sad, or confused. I now see that it’s the measuring of my experience against some ideal and unrealistic standard that feels so extra bad. It’s my resistance to what I am actually experiencing that feels terrible. So now I say, so what if I feel a bit of discomfort, or things are a little dull inside me, or between my man and me? So what if I am experiencing numbness or just okay-ness? I can just let it be what it is, knowing that it is normal and healthy, and it will change soon anyway. I’m not suggesting we tolerate abuse or mistreatment for any percentage of time; just that it’s normal to not always feel head-over-heels in love and blissfully happy. One of the biggest benefits of “embracing neutrality,” as I call it, is that my joy is amplified during the times my partner and I are really connecting well. How could I even know what good was if I never felt it’s opposite? Contrast is the truth of life. Contrast is part of our humanity. To have a rich love life, embracing all our feelings is the only healthy path. Because, as we allow it all, we fall deeper in love with life, and everyone in it. Though my life is filled with the same amount of sad, annoyed, frustrated, bland, and ho-hum moments as ever, the way I experience them has entirely changed: so much softer, so much less agonizing. And as I have practiced being accepting of the neutral times, I’ve actually begun to appreciate them more. When I welcome neutrality, the ho-hum moments almost start to feel good, too. That means I now feel more good feelings than bad ones, by far. 1. Use gentle awareness and be really honest with yourself. When you notice you are feeling less-than-great (just less-than-great for your first few times, not terrible), get curious about what you are really sensing. Feel your emotions. Notice what physical sensations are there. Do you feel constriction? Or openness? Or a vague sense of nothing? Rate this body-feeling on a scale from one to ten, ten being the best you could feel, five being neutral, one being terrible. 3. If you rate below a six, really investigate with curiosity how that feels in your body. Allow it to be as it is. Notice that it isn’t a problem to not feel good. It’s just a bunch of interesting sensations. Even unhappiness isn’t so bad when you look at it with gentle curiosity. You are safe to experience what you feel. When you do this a few times a day you will expand your capacity to tolerate discomfort. You may even realize that you can actually enjoy your significant other’s imperfect behaviors and human quirks that were bothersome in the past. Because most of us, let’s be honest here, are a far cry from perfect. No one will ever truly fulfill and delight you all the time. That is actually your job, not your partner’s! It is your work to drop the expectations, comparisons, judgments, fears, and beliefs that are interfering with the health of your relationship and to learn to care for the normal, bland, day-to-day humanness of your sweetie. Because if you don’t embrace the dull times, you are much more likely to lose the whole glorious package by rejecting your experience and your partner a majority of the time. If you embrace neutrality like I have, instead of believing it means something has gone wrong, the neutral times become like a glass half full (instead of half empty). The good times become rich and wonderful. And those truly hard moments? They are simply reminders of how delightful the good times actually are, and reinforce their joy.